Betrayal lurks at Eden Hall. 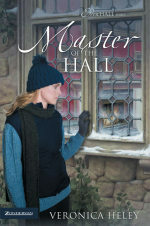 Eden Hall, the ancient English stately home, has brought Araminta “Minty” Sands more joy—and heartache—than she could ever have imagined. She’s worked hard to keep it open to the public; but, exhausted from looking after the twins, Minty has no energy to maintain the Hall as she once did. Worn out, fearing another trouble-filled pregnancy, she’s also pushed her husband, Patrick, away physically and emotionally. And now, her old enemy has returned: Judith Kent, who was once known worldwide as Maxine, an amoral rock star. Claiming to be reformed, Judith begs Minty for a job. Against her better judgment, Minty agrees. Then, with Patrick in Brussels on urgent business, mysterious “accidents” begin to happen, endangering Minty and her twins. When a horrifying secret surfaces —one that, if made public, could destroy the Hall and everything she has worked for—Minty realizes time is running out. Has Judith really turned her life over to God, or is she plotting to take over everything Minty has—including Patrick?